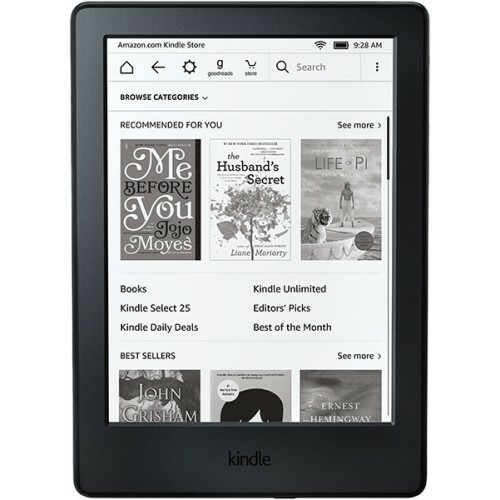 Amazon Kindle E-reader 8th Gen 6” Paperwhite display technology with E Ink Pearl, 167 ppi, optimized font technology, 16-level gray scale. It has 4 GB holds thousands of books or a dozen audiobooks; Audible audiobook capacity based on average Audible audiobook size.Free cloud storage for all Amazon content.In additional has 6.3"x 4.5” x 0.36” (160 mm x 115 mm x 9.1 mm) display size and 5.7 oz (161 g) Actual size and weight may vary by configuration and manufacturing process.single charge lasts up to four weeks, based on a half hour of reading per day with wireless and Bluetooth off and the light setting at 10. Battery life will vary based on light settings, wireless usage. Audible audiobook streaming over Bluetooth will reduce battery life.Fully charges in approximately 4 hours from a computer via USB cable.